Please install the Unity Web Player to play Sniper Training! You're a new student at the military academy, and sniper training begins today. Snipers are one of the most important parts of any military team. While other gunmen rush the front lines, snipers take fight from a distance. Instead of spraying bullets aimlessly, these sharpshooters methodically plan every shot. 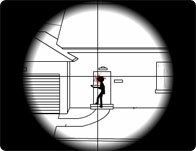 Now it's time to begin your training, so ready your aim and shoot for the bullseye in this fun online shooting game!